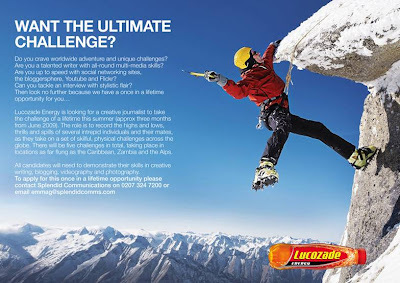 Lucozade blogger challenge - apply for a worldwide adventure! The challenges will apparently by announced shortly and then followed with video clips, images and live feeds – I’ll update this post when I get them. Contact Splendid Communications on 0207 324 7200 (emmag@splendidcomms.com) and leave a comment here with a link if you apply!